Extension point for running JUnit tests in a RCP Application instance? 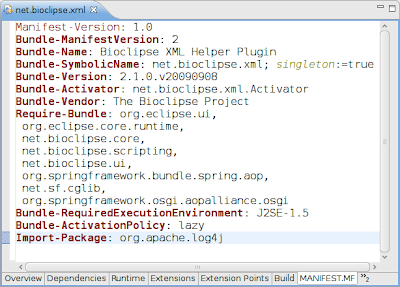 One thing that has been on my wishlist is to be able to run the unit tests we have for Bioclipse from inside a running Bioclipse instance. 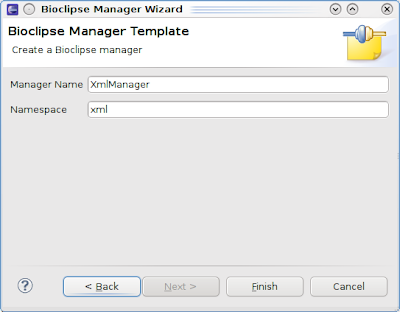 That is, we have a Bioclipse Test Suite features on the update site, matching the functional features we have there. Each such test suite would run all JUnit tests we have for that feature. Now, the tricky thing is likely the following. How do we get to run all test suites? That is, I don't want to need to have to run the suites for each feature separately. Of course, this is exactly what extension points are for. So, my question is, did anyone set up an system like this? And, is there an extension point that allows features to plugin additional JUnit test suites into a larger test suite dynamically? With the JChemPaint workshop just passed, there is much work from UU and the EBI to be integrated. 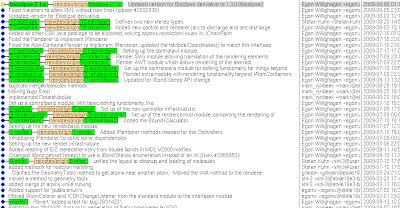 Moreover, Rajarshi just merged a lot of fixes from CDK 1.2.x into the master branch, which will be a big rebase too. That said, I need to do this to recalculate source code statistics for the CDK. 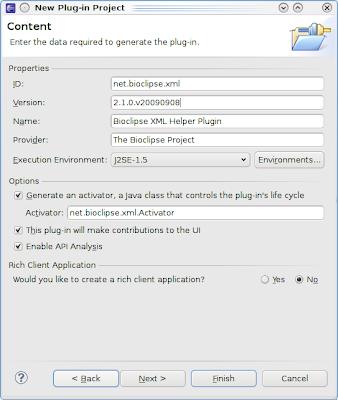 The two top most branches (bioclipse-2.1.x and 12-ebiStage) are actually staging branches: patches that have not yet been integrated into the JChemPaint-Primary branch. Likewise, the 0-other branch is a staging branch for patches that are in or up for the review process for CDK master itself. This will mean that I am now going to rebase all these branches once more. Next, is to write a piece of code that creates HTML+RDFa+BIBO from a BibTeX file, and to write a plugin for Bioclipse to extract triples from HTML+RDFA. With pleasure I read Analogue or Digital? - Both, Please. Funnily, I just created MP3 (or, preferably Ogg Vorbis, superior but hardly any support by commercial companies, who rather seem to pay license fees) directly from the CD. Anyway... the blog wanders of to Google introducing searchable books, with many out-of-copyright. I was wondering how many chemistry books the pre-1923 book set included, and that actually sums up to about 41 thousand books, just for the chemistry search term. There is quite cool stuff there, like the English translation of the works of Lavoisier. This is really cool! I can just download this onto my eReader (which I don't have yet anyway, but my Dell laptop will do fine; if only the PDF was broken), but this actually allows me to read all the stuff I read about when doing History of Chemistry in the last year it was given in Nijmegen, back in 1993. Which was funny in itself, as the course was for second year students, but one of my introduction tutors suggested me to take it, which I did. It was a great course, by a great teacher, btw! It is a shame that the course was lost from the curriculum, much like I hated to see electrochemistry and cheminformatics lost in Nijmegen. Severe and very regrettable loss of diversity in the education there. Anyways, I'm going to need hours to browse all the goodies there. Did you spot the 1913 copy of the CRC Handbook of Chemistry and Physics yet? I am looking forward to seeing people starting text mining on these books... anyway? VRMS meme: how much non-free software are you running? Over at Planet Ubuntu there is a meme running around VRMS (Virtual Richard M. Stallman, brilliant name!) which finds non-free software on your desktop. 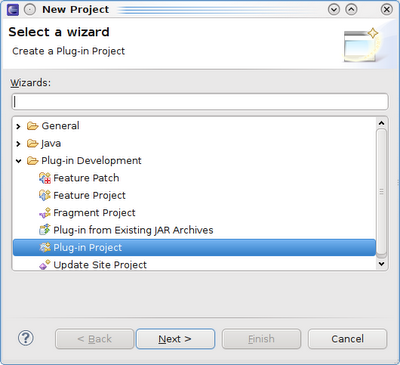 I uninstalled Sun's Java6, for which there is the OpenJDK6 alternative. 9 non-free packages, 0.4% of 2050 installed packages. 4 contrib packages, 0.2% of 2050 installed packages. Well, I have yet to read the paper in detail, but my new student Samuel is going to work for 20 weeks on defeasible reasoning with DrProlog in Bioclipse. As I reported earlier, progress is only possible of you can modify and redistribute. This is why Open Data, Open Source, and Open Standards are so important to us Blue Obelisk members. For data, proper licensing makes these two requirements possible, but more importantly, make those rights explicit. 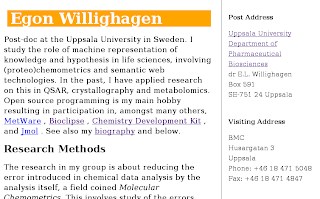 Rich is running the nice Zusammen blog, but most of his entries are not Open Data. 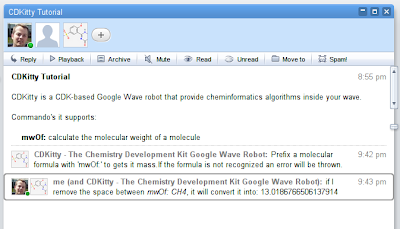 Even larger chemistry data repositories can be vague and have seemingly contradicting statements. One project which did it right, was the NMRShiftDB. They were ahead of their time and did pick a proper Open license. By current standards not the best data license (the GNU FDL), but the best at the time. To push real Open Chemical Data a bit more, I will create a series much like Rich' series, but will make the restriction that the sources are clear about what rights they give users and that those include the rights to modify and redistribute the data without unreasonable restrictions. I will not say much about the database itself, and even less now, as I think the NMRShiftDB is well-known amongst my readers. Now, the only problem is, I need candidate for this series, and cannot actually think of a third entry (second being the Open Notebook Science Solubility data)... Want to help me out? 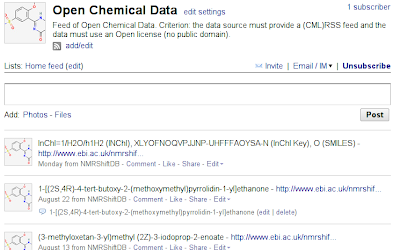 Please let me know which chemical database is using a Open Data license. At the JChemPaint workshop here in Uppsala, where we have Mark from Chris' group as our guest, we encountered an inconsistency in CDK 1.2, where the bond stereochemistry did not yet follow the pattern recently adopted of having Class fields, to allow using null to have the semantics of undefined. Previously, the defaults for native values were confounded with set values. For example, the formal charge unset and 0 would be have a field value int = 0. So, I am now writing a patch which replaces the use of int in IBond.getStereo(). But instead of going for Integer, the patch is actually going to use a enumeration. Now, getting the the Art of Programming... while writing patches in the CDK, you run into those lovely bits of code, where intention is mixed with implementation details. They should not, and often do not need to, but they typically do. This is actually one reason why we now have a more strict peer-review installed. Below are two nice examples where intention is mixed with implementation detail. This code is bad because we have no clue of what this code is supposed to do. When should the if-clause kick in? Be reminded that the int = 0 has the confounded meanings of no stereochemistry and perhaps has stereochemistry, but no one ever bothered telling me. So, which of the two situations does the if clause apply to. So, my patch can only assume that both were applicable (following the actual implementation), though I don't think that makes sense on an algorithmic level. Had the author used CDKConstants.STEREO_BOND_NONE (which is the implementation for int = 0 for no stereochemistry, then I had known what the implementation was doing. Instead, the author chose to reuse implementation details: a hardcoded 0. This example also uses hardcoded value, instead of the matching constants. Remember that int = 0 had the meaning of no stereochemistry, so I assume this code is determining is stereochemistry is defined for the bond, making nice use that those situations at some point were coded as non-zero values. Moreover, it is only interested in a few stereochemistry definitions, and from the implementation I learn (and that actually makes sense at this location) that it is only interested in those stereochemistry for which the first bond atom is the stereochemical center. This again is leaking implementation details, instead of using semantically meaningful constants. 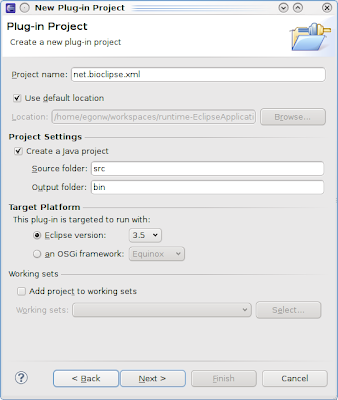 Last Friday, the Bioclipse 2.1 development series moved to Eclipse 3.5, so I had to update the Bioclipse SDK too, which we developed earlier. 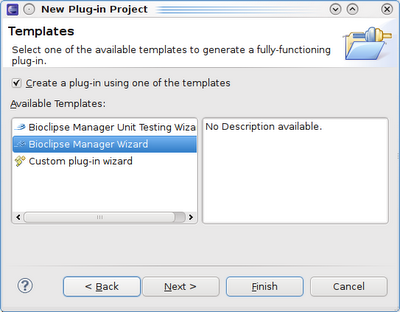 With a new Eclipse version also comes new screenshots to talk you through the process of setting up a new Bioclipse manager plugin. 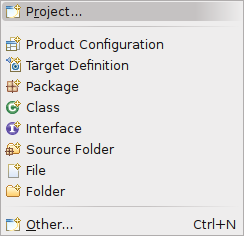 Then click Finish and let Eclipse set up the new project. This morning I had some more fun, and since the statistics view on the NMRShiftDB server is down, I though I could recalculate the statistics myself. Because the current RDF version of the data does not include all information yet, I cannot reproduce all of them. On the other hand, I can determine some other interesting statistics. I am a bit surprised by the count for the silicon NMR spectra, as I would have thought I alone had entered more than just five. That is going to change, as the paper I am digitizing now (doi:10.1021/jo971176v) has carbon and hydrogen NMR spectra for 7 solvents for each compound :) It should be possible to summarize the number of molecules for each number of spectra per molecule, but did not manage to get this SPARQL to work out well. BTW, did you know you can find reprint PDFs of a paper (if any; this one happens to have a PDF copy) with Google using the title in quotes and filetype:pdf? Try this query. The top hit was molecule 10016314 (RDF), which has 4 13C spectra, one 15N and two proton NMR spectra. It shows that molecule 10023801 (RDF) has 5 different NMR types: 13C spectra, one 15N, 29Si spectra, one 17O, and 1H spectra. Unfortunately, the compound also has chlorines, so it disqualifies as molecule for which NMR spectra are available for all its elements. About 6 months ago I reported about my efforts to RDF-ize the data from the NMRShiftDB. Since then, time was consumed by many other things, but now that Bioclipse can query SPARQL end points, that I want to contribute the triple set (it is GNU FDL-licensed) to Bio2RDF, that a student started working in my group (now larger than just me :) on reasoning on life sciences data, and that I recently contributed my 1000th NMR spectrum to the database, I thought it was time to finally reinstall Virtuoso. Nice thing about this is, that I can set up multiple servers, allowing me to keep incompatibly licensed data sets apart (see Open Data: license, rights, aggregation, clean interfaces? ), which is the same approach Bio2RDF is taking. The end point now offers about 278887 triples, but this will soon rise as I make more content from the database available in the original SQL database. The data is from the 1.3.3 release by Chris' team, and does not include my 1000th spectrum. Scientifically, this progress is not overly interesting, although it makes it very clear that you really should not have to be happy with proprietary and non-semantic formats for anything. But, to me, this is mostly a technological success of great importance: I can now share really large sets of RDF data. Querying this data is a simple with SPARQL, and the results are available in various formats, such as JSON, which makes it easy to integrate in third-party applications or Google Wave robots (did I hear someone say NMRShifty?). As I have blogged before, SPARQL is an excellent tool to aggregate scientific data prior to data analysis. And I will demo more interesting queries later this month. View more documents from egonw. BTW, it seems I messed up the regular expression, which seems not to be including the last digit (filed as issue 1). Almost forgot to add that: many thanx to Cameron for the insightful discussions we had over applecider, Weisse and German dinner on Monday evening!